Six days across Wales from the English border to the Irish Sea covering 100 miles and five inns en route. We all look forward to welcoming you on The Border to Sea Mountain’s Trail. 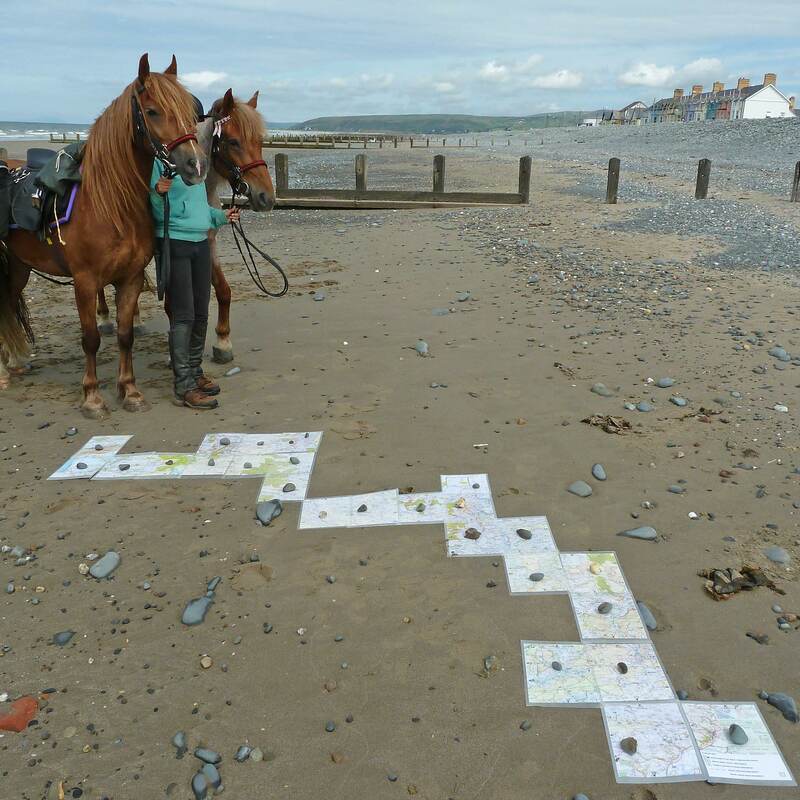 The Border to Sea Mountains trail ride starts near the Welsh/English Border in the Wye Valley and finishes on the sands of the Dovey Estuary on Cardigan Bay – six day’s journey in the saddle crossing Wales along unmarked tracks and trails through wild remote hills and mountains. Staying overnight at small inns along the trail. Riders carry spare clothing and personal effects in expedition saddle bags attached to the saddle. 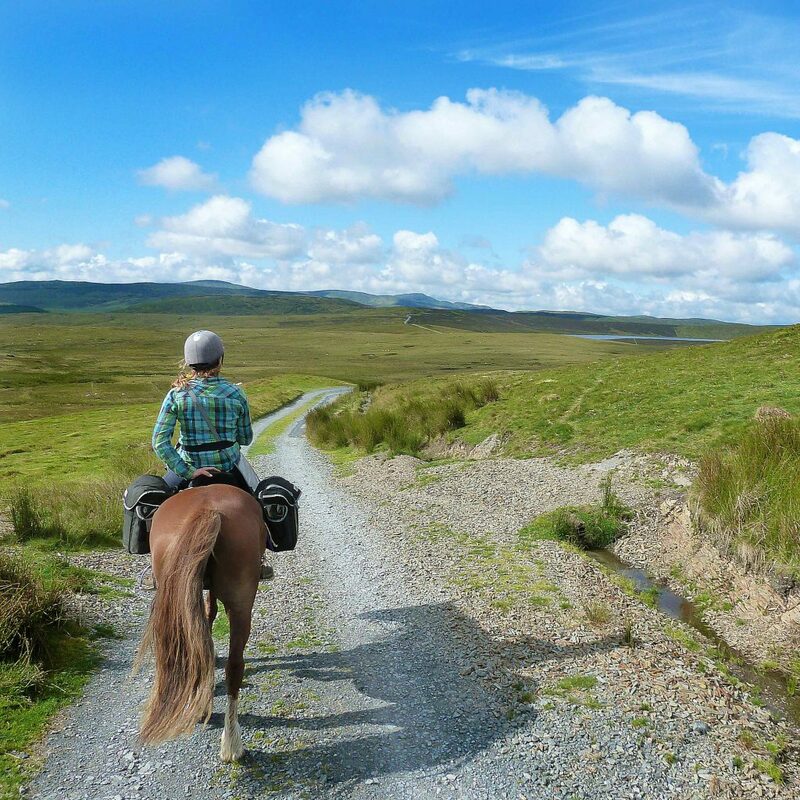 The route covers over 100 miles in total and is suitable for those who are happy and confident cantering and also have a sense of adventure! The trail is a completely different route to the Trans Cambrian South apart from the final day. The first section of this trail heads northwards across the Radnor Hills towards Radnor Forest to stay at the Red Lion/Fforest Inn. Then follows the Ithon Valley up to Laurel Bank Abbeycwmhir. From here there is a rugged jumble of hills & valleys as you cross the Marteg Valley and descend into the Wye Valley at Llangurig. After a night at the Blue Bell in Llangurig head north into the Hafren Forest, ford the head waters of the River Severn and emerge onto the wilds of Plynlimon. After a comfortable night at the lonely Star Inn saddle up early and set forth to cross the wilds of the Plynlimon Mountain range. Then follow the Hengwm Valley or descend steeply down Glyndwrs Way then climb back up through woodlands before the final descent into Talybont. On the fifth day the northerly and southerly riding holiday routes join and riders stay the night at Talybont. Here, accommodation is at the White Lion Inn. 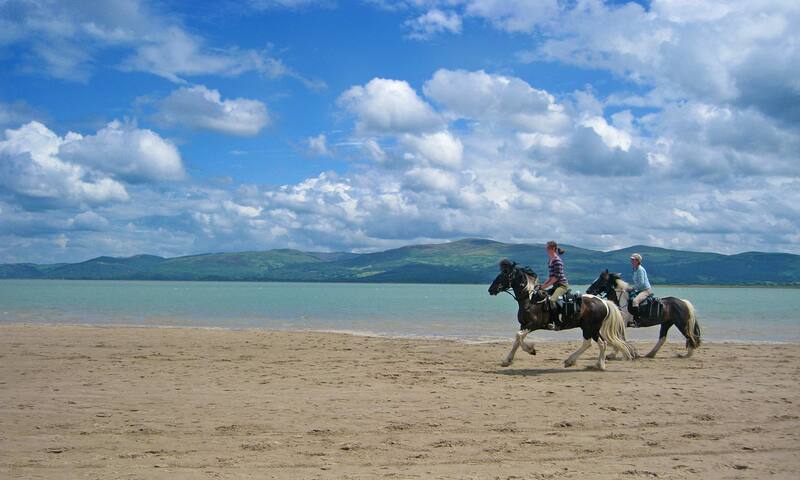 From Talybont it is a leisurely ride to the coast at Borth then a 3 mile ride along the sands to Ynyslas to meet the equibus for the return journey to Freerein HQ. For this trail ride, you arrive at Freerein HQ at 9am. Pack all of your belongings for the week into the Freerein expedition saddle bags. Meet and prepare your horse. Out on trail all day to the Red Lion Inn. A long first day with lots of trotting. Arrive at your accommodation, untack, feed & turn your horses out in the field. Enjoy a relaxing evening at Red Lion/Fforest Inn. Feed, groom and tack up your horse. Out on trail all day to Laurel Bank, Abbeycwmhir. Feed, groom and tack up your horse. Out on trail all day to Blue Bell at Llangurig. Feed, groom and tack up your horse. Out on trail all day to the Star Inn. Feed, groom and tack up your horse. Out on trail all day to Talybont, stay the night at The White Lion. A shorter last day allows for plenty of play time on the beach! This would have been a once in a lifetime holiday, but I know we'll be back for more . . .